This February, the Blue Valley Recreation Center at Hilltop showcased the sport of table tennis with a prestigious youth camp and tournament as well as the Kansas Table Tennis Winter Open. Blue Valley Recreation played host to two table tennis tournaments as well as a prestigious junior camp Feb. 1-3. The 2019 Kansas Table Tennis Winter Open featured players from beginner to professional level while the 2019 USATT/ITTF Regional Hopes Camp and Junior Tournament covered the south-central region of Arkansas, Kansas, Louisiana, Missouri, Oklahoma, and Texas. This year marks the first year for the USATT regional camp and junior tournament to be held at the Recreation Center (7720 W. 143rd St.) as the site is one of eight nationwide and is the first time the two have been held in the central region of the country. The Winter Open was a USATT two-star sanctioned tournament sponsored by the Kansas Table Tennis Association (KTTA), XIOM, and Paddle Palace. It featured a round robin competition followed by a single-elimination bracket. Matches were best 3-of-5 games to 11 points with the final matches 4-of-7 games to 11 points. 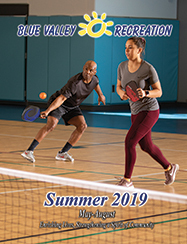 "Drawing individuals from states in the south-central part of the country showcases our great facility and extends the positive economic impact Blue Valley Rec has on the community," said Blue Valley Recreation Executive Director Steve Baysinger. "We are excited to open the Rec Center to unique programming." The Regional Hopes Camp and Junior Tournament (for youth under the age of 15) are part of the International Table Tennis Federation Hopes Program, which is a series of regional, national, and international camps and competitions designed to spark movement and interest for skilled and talented young table tennis athletes who have a love for the sport. At the camp, players received expert coaching and training from USATT National Team coaches Pieke Franssen and Wei Qi, former China National Women's Team member Yue Jiang, professional player Siyi Lin, and local Blue Valley Table Tennis (BVTT) coaches. Dr. John Chen, a professor at KU Medical Center and head coach of BVTT, knows first-hand the joy of the sport that has been increasing in popularity. "The best thing about table tennis is that anyone can play it," said Chen. "It improves hand-eye coordination and mental acuity while providing a great opportunity for social interaction."